Mitt Romney and the Republicans raised a combined $100m (£64m) in June, laying down the gauntlet to an Obama campaign that is scrambling to keep pace. The figure excludes the millions raised by independent groups that support the Republican presidential candidate. President Barack Obama and the Democratic Party have not yet released their fundraising results for June. Mr Obama spent the day in Ohio as he launched the first bus tour of his campaign for re-election in November. In May, the Romney campaign out-fundraised its rival, attracting $77m against the Obama team's $60m. Mr Obama has been warning supporters that he is in danger of becoming the first sitting president in history to be outspent by his opponent. According to Mr Romney's campaign aides, much of the money raised in June came from new donors, Politico reported . Several states, including the key battlegrounds of Colorado, Michigan and Ohio, exceeded their fundraising goals, they added. Meanwhile, Mr Obama pitched a positive message on Ohio's economic recovery and the comeback of the state's car industry. Ohio's unemployment rate of 7.3% compares with a national average of 8.2%. Ohio is a key battleground in presidential elections - no Republican has ever won the White House without capturing it. A Quinnipiac University poll of Ohio voters last week had Mr Obama leading his rival by 47% to 38% in the state. Earlier, the Obama campaign had run a barrage of attacks on Mr Romney's business record. "I'm betting you're not going to lose interest," Mr Obama told voters in Maumee, Ohio. "I'm betting you're not going to lose heart. I still believe in you, I'm betting on you." The president also touched on his landmark healthcare reform act, which was upheld by the Supreme Court last week. "It is going to make the vast majority of Americans more secure," he told supporters. Mr Romney has pledged to repeal the law if he wins office. On Friday, Mr Obama will finish his bus tour with appearances in Poland, Ohio, and Pittsburgh, Pennsylvania. Mr Romney, a former Massachusetts governor, said the president had "no new answers" for the economy. His team was seen as having been put on the back foot by the president's order last month halting deportations for children of illegal immigrants. The Romney camp also delivered conflicting responses to Supreme Court ruling last week on healthcare. And there were negative headlines this week over a Vanity Fair investigation reporting that much of Mr Romney's personal fortune was hidden in a network of opaque offshore investment havens. The Washington Post reports that the former private equity chief is planning to boost his team, while keeping his inner circle intact, in response to recent conservative criticism of his campaign. Concerns over Mr Romney's strategy were vented in an an editorial in the Wall Street Journal this week. It accused Mr Romney's staff of "slowly squandering an historic opportunity". The newspaper is owned by Rupert Murdoch, who called for a Romney campaign shake-up days ago. 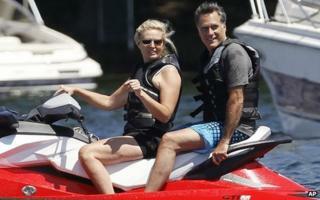 Meanwhile, pictures of Mr Romney on holiday with his family this week in New Hampshire prompted conservative radio talk host Laura Ingraham to tell listeners: "There's no week to spare, we have a country to save." With the economy such a major issue in the coming election, both campaigns will be eagerly awaiting figures due on Friday showing if there was any rise in hiring by US employers during June.